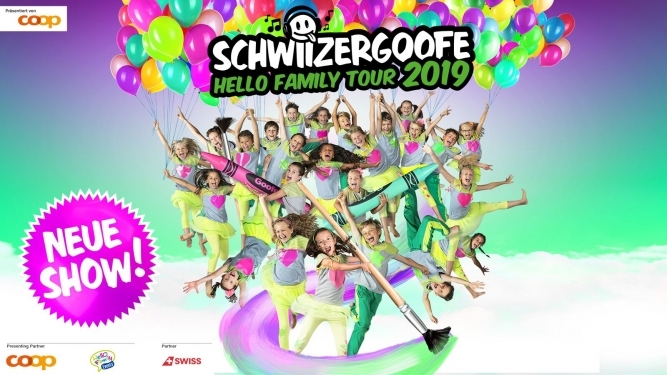 "Schwiizergoofe" Hello Family Tour 2019 - Brand new show with the greatest hits! Experience a big show with your children, impressive like a rock concert and happy like a family celebration. The cheekiest children's choir in the country sings the most famous and popular songs of all "Schwiizergoofe" albums, packed into an entertaining story for young and old. The "Schwiizergoofe" are children between the ages of 8 and 12 from different regions of Switzerland. They sing specially composed, cheeky and modern dialect songs for children. The albums of "Schwiizergoofe" all directly entered the top 10 of the official Swiss charts and have reached platinum status. Minimum age: None. Children up to 2 years enjoy free entry. Please present a valid ID.